Looking for a fun project to do with your little one? 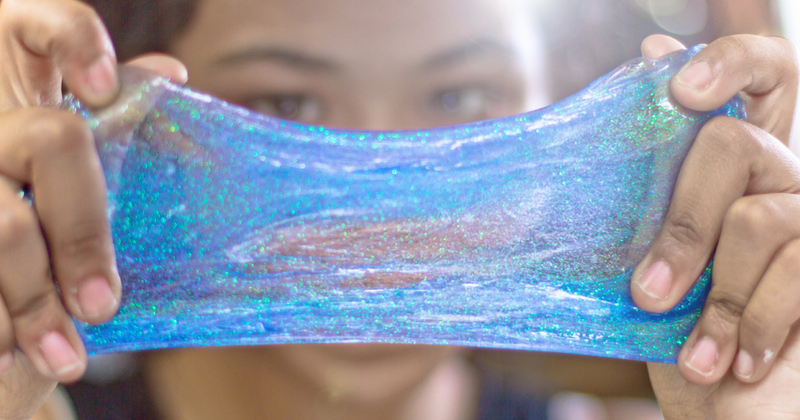 Create some sparkly slime with this easy tutorial! 1. Add ¼ tsp borax powder to a bowl with 500ml (two cups) of boiling water and mix until the borax dissolves. Allow it to cool off. 2. Add 250ml (1 cup) of clear glue into the bowl. 3. Add 2 drops of food colouring and glitter to the glue. 4. Add a ¼tsp of bicarbonate of soda to the bowl. 5. Start adding your borax mixture teaspoon by teaspoon, stirring continuously. 6. The mixture should start stiffening by thethird teaspoon. If it’s not hardening, add a little bit more borax mixture and stir again. 7. Keep stirring and kneading the mixture, as soon as it stops sticking to the bowl – it’s ready to go! We recommend following the instructions for glitter slime very closely, especially if this is your first time. Something that may seem to quicken up the slime process could give you a super rubbery or sticky slime, which is no fun! Most of the time that slimes fail is due to the amount of borax. If you use too little borax, the slime will be super stretchy and a bit sticky. If you use too much borax, it will be hard and rubbery. Although all glue used is non-toxic, borax is an ingredient in many household laundry and cleaning products. Borax, also known as sodium tetraborate, is a mineral that naturally occurs when a lake bed evaporates. While generally considered non-toxic in the form of borax (not to be confused with boric acid), it is recommended that you avoid any eye contact with it and as tempting as that slime looks, no putting it in your mouth. If you’d prefer to make green, pink or any coloured gooey slime, substitute the clear stationary glue for art and craft white glue (i.e. Bostik). It looks milkier, but its consistency is better and it’s a bit more stretchy. Please note that white wood glue doesn’t work. If the children accidentally spill some slime on your carpet or their clothing, just use a bit of vinegar to remove it. It will dissolve the slime!